As the days count down to the holiday season, gift givers everywhere struggle to find thoughtful gifts that serve a purpose. Even better are the gifts that are purpose-driven as well, leaving a lasting social impact on not only the one who receives the gift, but also the planet at large. Here’s a list of our favorite items that are guaranteed to help anyone travel with ease, and feel good about it. 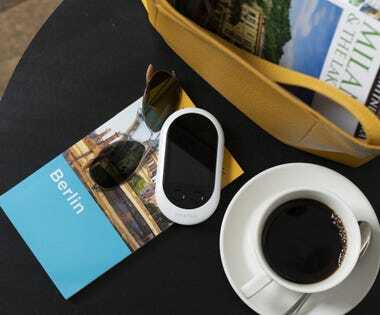 Learning the basics of a new language will always score brownie points when traveling, but Pocketalk is the must-have smart gadget that enables instant two-way communication with locals in their native language. Travel freely with this pocket sized translation device that understands and translates to 74 different languages (with more on the way). Available with a built-in two year mobile data plan using a Global SIM card, there’s no need for WiFi. Pocketalk eliminates the worry of things getting lost in translation, allowing for a deeper and meaningful connection when experiencing other cultures. Inspiring equal parts wonder and wanderlust, Atlas Obscura is described as ‘An Explorer’s Guide to the World’s Hidden Wonders,’ and within the tome’s pages, it celebrates more than 600 of the strangest and most curious places in the world. A publisher of best-in-class journalism about hidden places, incredible history, scientific marvels and gastronomical wonders, Atlas Obscura’s mission is to inspire wonder and curiosity about the incredible world we all share. Their second book, geared towards ‘The World’s Most Adventurous Kid,’ is the perfect gift for budding globetrotters. One Eleven watches are slick, modern and eco-freindly and the new SWII design is no exception. Solar-powered and made of 85% reclaimed materials (the strap is made of recycled plastic water bottles and the case is comprised of castor bean oil byproduct), this unisex style screams sustainability. With a battery that lasts 10 years (like all One Eleven watch batteries), the SWII is also water resistant with a hardened mineral crystal lens, making it good for any outdoor adventure, as well as the planet. Recently, The North Face announced that it reinvented one of its largest product lines, ThermoBall, using recycled materials and taking an important step toward creating sustainable change at scale. ThermoBall Eco is the same lightweight down alternative jacket, with the same ThermoBall performance that customers have raved about, but now the difference is a reduced environmental footprint as each jacket’s recycled insulation diverts at least 5 plastic bottles from the landfill. The new innovation builds upon The North Face’s commitment to using recycled fibers across multiple product lines and the launch of their Bottle Source line, which is sourced from plastic bottles from national parks. Durable and highly-packable, this jacket is perfect for staying warm on any trip. A boutique brand based in Nashville, Lilyan James designs products for women that forge their own paths, creating versatile products that explore ‘what it means to be a woman today.’ Prioritizing timeless techniques, the environment and the craftsman, Lilyan James values community, exploration and redefinition. After understanding the environmental and human cost of mass fashion, the brand chose to individually cut and sew all products, including their chic travel wallet, in the United States. To reduce waste, Lilyan James uses all parts of the hide, allowing for slight, natural variations to the leather grain, creating unique characteristics that reflect their environmental sustainability. With a vision to create casually elegant handbags, Lilyan James’s travel wallet is the perfect complement to any luggage collection. Energy improves health, combats climate change, enables communication and education, generates income and empowers women. Global access, however, remains a challenge but BioLite is on a mission to bring energy everywhere. The company creates affordable, durable products that harness solar energy. Their portable solar lights enable you to leave the batteries behind use the sun to capture up to 50 hours of run time. A highly effective personal light, this 4-pack is perfect for outfitting friends and family during your next outdoor adventure or power outage, and it’s ultra packable since it’s the size of an ice cream sandwich. Banana Backpacks created the ultimate travel backpack, designed to optimize the travel experience in style without sacrificing the space required to carry additional gear. Ergonomically designed to take up to 80% of the weight off of shoulders, the Khmer Explorer Travel Set is the company’s signature backpack that has a three-piece removable packing system. Weatherproof and with unique features that include a secret interior compartment, mesh separators with built-in pockets, a hip belt pocket and removable shoulder straps that can be tucked into the back compartment if the bag needs to be checked at the last minute, the backpack company also has a social mission. The name of a student is embroidered in Khmer on the strap of every backpack. Each purchase provides an annual education for one student in the Siem Reap province of Cambodia, one of the poorest provinces in the country. A collapsible, pocket-size and eco-friendly hydration bottle, the Hydaway Bottle is the perfect fit for any travel excursion or outdoor adventure. Made from food-grade silicone, the Hydaway Bottle is portable, easy-to-use, and travels anywhere. The innovative, hinged design allows it to pack down flat (1.25 inches thick) to fit in a pocket, purse, carry-on or backpack. With a flip-up straw for quick sips, carabiner-friendly carry handle, and watertight guarantee, the bottle expands fully for drinking and when you’re finished, it collapses flat so you can stash it away. BPA-free, taste-free, odor-free and dishwasher safe, it’s available in 12 colors and perfect for any trip.